A QT-8000 VGA port provides an expansion PC monitor connection for a customer display. This system can display data on both the LCD and the expansion PC monitor separately or simultaneously. The full contents of customer purchases and store advertising, etc., can be displayed on the expansion PC monitor. A high-performance Celeron 1.2GHz processor and Standard 256MB double data rate memory offer reliable and speedy processing for growing business as well as flexible I/O ports, four com ports and four USB ports for a variety of peripherals. Expand the standard 256MB memory up to 1GB to meet your business needs. A lower profile frees space for other uses. 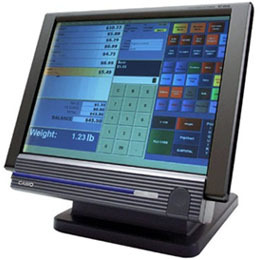 Designed by POS experts for POS professionals, the QT-8000 is suitable for various applications. A QT-8000 offers various installation methods for the customer, for example stand type, integrated with table and wall mounting options.